The Union of Italian Jewish Communities is the national umbrella organization that brings together the 21 Jewish communities that are distributed throughout the Italian territory. 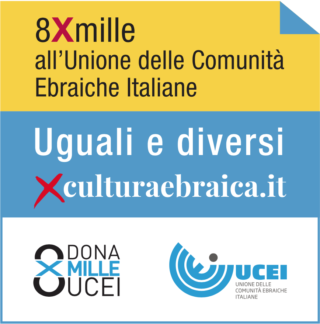 Its action takes place in representing the Jews of Italy towards Italian and foreign institutions and authorities, in the coordination of the communities and of the community members and the promotion of education, cultural, religious and social activities. – “DafDaf”, the Jewish newspaper for kids. This is a print monthly for children. All printed newspapers are produced by rotary press in full colour and have an average monthly circulation of about 30,000 copies. The circulation reaches peaks of 100,000 copies when extraordinary distributions are undertaken in the occasion of the important cultural festivals. The electronic editions are constantly updated with the entire contents of the print publications, and enriched with multimedia content. These are accessible via tablet, an app and a digital magazine reader (both online and on Facebook). Feeds on social networks such as Facebook and Twitter are constantly updated and viewed by thousands of users. These publications rely on the work of a professional editorial staff and the participation of 120 authoritative volunteer contributors. The publications reach the Italian Jewish public and wider Italian society which observes the Jewish cultural and political world with interest. They are often cited as reliable and authoritative in both the Italian and international media.